A “galette” might sound super fancy, but it’s really not. Essentially, it’s pie for people who really don’t want to be bothered with making a pie. You don’t even need a pie pan! Just put in a mound of filling in the center and just fold up the edges to make the sides. Very rustic. 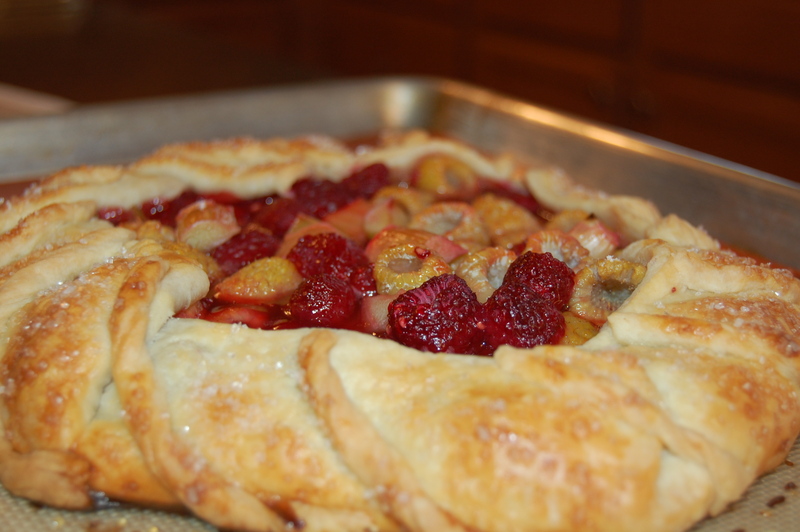 So, this particular recipe is for a sweet free-form tart, but there are also savory types. I do have a recipe for a Mushroom Galette using different types of wild mushrooms, a nice stilton, leeks, caramelized onions, and some thyme. I’ll post that at a later date. 1. Preheat oven to 375. Place raspberries and rhubarb in a medium-sized bowl. In a separate bowl, blend together the sugar, salt, and cornstarch. Gently fold in the sugar mixture into the fruit. Let stand for 15 – 20 minutes; if it sits too long, the rhubarb could get too mushy. 2. Roll out the half of the Pate Brisee to about a 12-in round. Pour the fruit into the center of the crust, leaving about 1 1/2 in border. Gently fold up the sides to form pleats; you can pinch them to seal. Brush the crust with the egg wash and dust with the sanding sugar. 3. Bake for about 45 minutes, until the crust is golden. Let cool slightly. Slice and serve with maybe a slightly sweetened whipped cream with some lemon zest. Vanilla ice cream is also a good accompaniment and maybe a sprig of mint. This entry was posted in Pies and Tarts, Recipe and tagged Pies and Tarts, Recipes.